Gavin with parents William and Margarette. "Gavin showed a flair and talent for art from a remarkably early age"
Gavin and friends working at Poulter's. "Gavin appreciated natural beauty as well as his ‘lumps of metal’!" 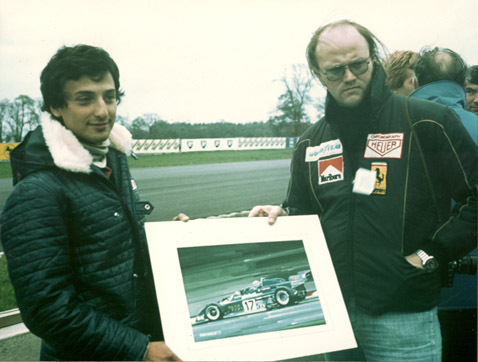 Gavin presenting Formula-1 driver Riccardo Patrese with an original at Donington Park in 1977. Gavin at the CART IndyCar Penske Racing Team's Christmas party, presenting team owner, Roger Penske with an original commissioned by the Penske Team. 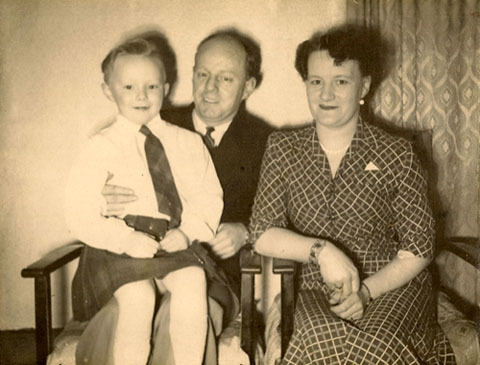 Gavin was born to Margarette and William MacLeod at home in Queen Street, Inverness, Scotland, on the 13th December 1951. During the Second World War Margarette worked in the catering section of the naval division in Dundee. She and William married in uniform in February 1945 and before Gavin was born his father worked as a railway maintenance engineer, later he delivered confectionery around the villages in the Sutherland district. Gavin showed a flair and talent for art from a remarkably early age, on one occasion drawing a picture in his pushchair which impressed an American visitor to such an extent that she persuaded William to let her take it back to the States – his first sale! Being an only child, Gavin was good friends with his cousins Roslyn and Lorraine who lived in the upstairs flat with his aunt and uncle. Later when Gavin was 10, both families moved south of the border to Sherburn-in-Elmet in North Yorkshire. Gavin’s accent caused teething problems after the move, as his fellow pupils struggled to understand his Scottish tone, albeit a mild one! In order to fit in he soon found that speaking the same ‘language’ was certainly a start! At school his strong subjects were art, history and English and he was the proud owner of a Blue Peter badge, awarded for winning an art competition. One of Gavin’s other favourite hobbies was building model planes. Gavin’s father was a keen footballer and refereed games in Inverness and Aviemore before the move to Yorkshire. For Gavin football was just as important and he played casually with his friends as well as regularly venturing over the Pennines with his pals to watch Manchester United at Old Trafford. Several matchday programmes from the 1960s are still kept at the family home. 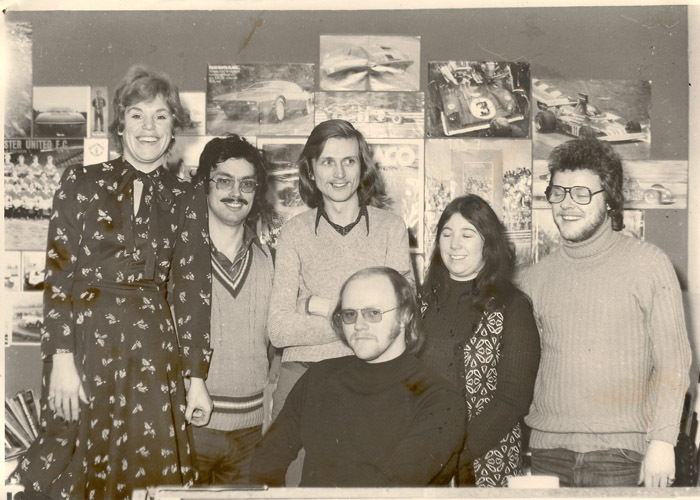 So it was that Gavin started a graphics course in September 1969 at the Jacob Kramer College of Art in Leeds. 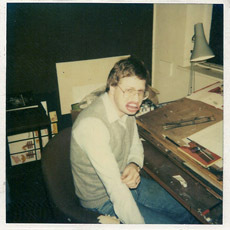 Here he studied colour theory, logos, photography, life drawing, typography and airbrush re-touching. After completing the vocational course he worked as a junior artist in a small advertising company in the city centre. After eight months he moved on to a larger company, Graham Poulter Advertising, one of the north’s major advertising agencies. They handled some leading accounts such as Porsche UK, Plaxtons Coaches, William Hill, Fox’s Biscuits, Nokia, Sega, Barratt Homes and many others. Gavin was initially employed as a finished artist, having developed his airbrush techniques, and he was then given the opportunity to produce full colour drawings for Porsche advertisements and other high-profile campaigns. It was during these years at the advertising agency that Gavin realised his flair and further potential for capturing motorsport at its most dramatic. Gavin met Christine at art college and they married in 1976. 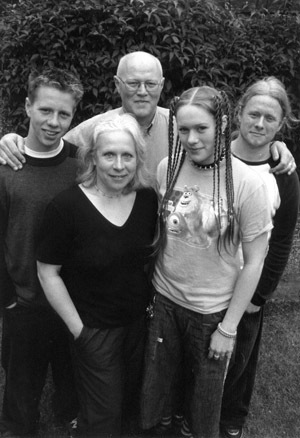 During Gavin’s years at the agency, Christine worked as an art and photography technician at Leeds Polytechnic College until 1981, when James, their first child, was born. 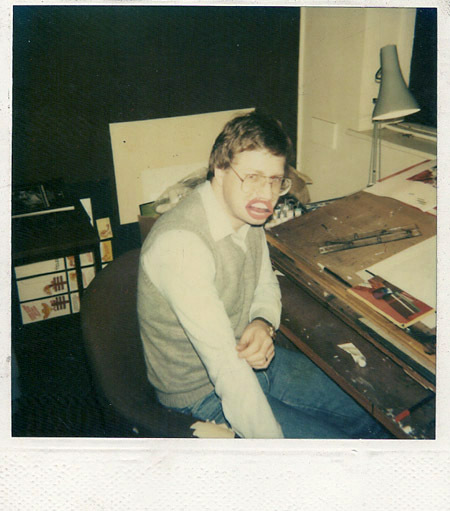 In the early 80s Gavin started to take on freelance work at home, during evenings and weekends, building up a client base and adding to his portfolio. When Gavin and Christine’s second child, Anna, was born, he made the move to self employment. 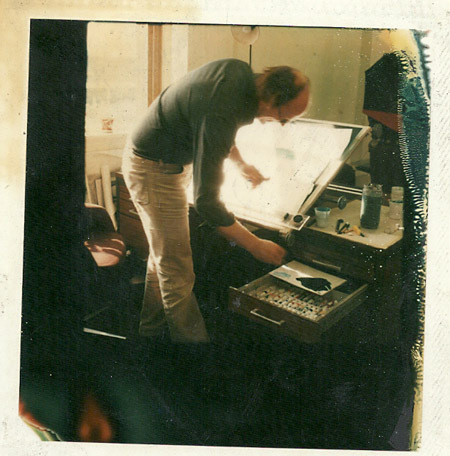 Gavin left the agency in 1983 and set up his studio at home ­– business took off. Work consisted mainly of illustrations for local and national advertising agencies. He illustrated an array of subject matter, ranging from cars, tractors, HGVs and coaches to medical dressings, pub interiors and airbus flight decks – a range that certainly kept him on his toes! Gavin signed up with a London-based artists’ agency that sourced illustration work for some high-profile accounts, providing him with regular commissions throughout the 80s and 90s. However, Gavin’s passion was always drawing high-performance cars. The arrival of the children prompted an extension to the family home. A purpose-built studio was created in the former loft space, giving Gavin more natural light and space to work in while providing him with views of wildlife, clouds and sunsets. Gavin appreciated natural beauty as well as his ‘lumps of metal’! In April 1986 Gavin took a few days break before the arrival of Alastair, his and Christine’s third child. He visited the factory of his dreams – Ferrari at Maranello in Italy. The ‘Prancing Horse Register’ tour included watching the San Marino Grand Prix at Imola, though Ferrari’s Stefan Johansson finished the race in fourth, with McLaren’s Alain Prost victorious. Gavin’s passion for Ferrari was reflected by his crammed bookshelves on their famous cars and his cabinet of hand-built models, which were meticulously assembled down to the minutest detail. In 1989 Humbrol/Airfix, the company based in Hull at that time, approached Gavin. Many pieces of original artwork had been water damaged after a fire at their premises and Gavin became one of the main feature artists to create new artwork for their box tops, producing more than 140 full-colour paintings over the years up to 2003. Some are still in print today, although a number have recently been replaced by computer generated images. Some of Gavin’s paintings can be viewed in the ‘History of Airfix’ room at the Hornby Visitor Centre in Margate, Kent. In 1992 Gavin was thrilled to have his designs accepted for the re-opening of the museum dedicated to the former Scottish Formula One world champion Jim Clark. 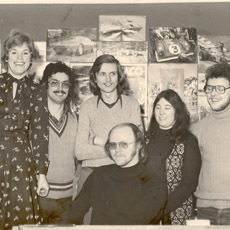 Gavin’s illustrations were used for posters and merchandise sold at the Jim Clark Room in Duns, Scotland. Gavin’s paintings were distinctive in that the car was always the ‘star’ – close up, in your face with as much colour and technical detail as possible, yet still giving the sense of an artistic rather than photographic feel. 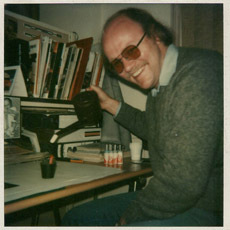 He worked on perfecting his technique for road textures and he experimented with using paper on outdoor surfaces to enhance background effects, such as aerial views of landscape. These methods added to his photorealistic style and a close up examination of the originals reveals a less photo-real technique than the first impression might suggest (see the iGallery). He occasionally heard the comment ‘nice shot’ but did not take it as an insult. In fact, Gavin wanted to successfully represent the realistic side of automotive art to convey the sense of excitement. There is some incredible talent that goes into producing a Gavin MacLeod painting, that is best witnessed when viewed close up. Gavin’s work received accolades from within the motorsport industry and many of his limited edition prints were autographed by drivers and team owners, including Mario and Michael Andretti, Jacques Villeneuve, Emerson Fittipaldi, Nigel Mansell, Paul Tracy, Al Unser Jr. and the late Greg Moore. Gavin exhibited his paintings at CART races, Silverstone Historic Festival, Monaco GP, the Barrett-Jackson Auction and galleries in Toronto. In 1994 Gavin had the pleasure of meeting Murray Walker at the Penske Racing Team’s Christmas party in Dorset. Gavin sent an art print from a Fangio painting to Murray’s home shortly beforehand, prompting a wonderfully gracious letter of thanks from Murray. Fittipaldi and Unser Jr. were also present, celebrating a stunning Indy Car victory. 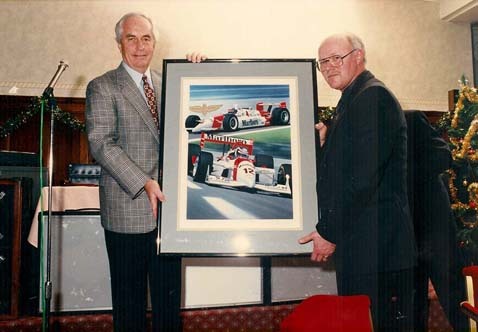 Gavin presented an original painting of the two Mercedes ‘Pushrod’ engine cars to Roger Penske. The illustration work and motorsport paintings were, in the late 90s, filling the majority of Gavin’s working week. By then the advertising work had reduced considerably, mainly due to the increasing versatility of computer technology which had, to a certain extent, encroached on the work of many ‘old school’ artists who produced hand drawn images. Many artists had to embrace the new technology in order to compete but fortunately Gavin was able to continue and a computer was never installed in his studio. Gavin with family...from left to right...Alastair, Christine, Anna and James. In 2001 Gavin was diagnosed with prostate cancer, the consultants informing him and Christine that the illness was advanced and that surgery would not be an option. Gavin was able to continue the work he loved until February 2003 when he was admitted to St. James’ Hospital. He passed away, with his family by his side, on 22nd February, aged 51. Two funeral halls were filled to celebrate Gavin’s life and mark his passing, the scale of the service reflecting how many people he touched in his personal and professional life. Two of his favorite songs were played on entrance and exit: ‘Wild Mountain Thyme’ by The Silencers and ‘Heroes’ by David Bowie. Gavin is survived by Christine, James, Anna, Alastair. January 2014 Update: Gavin's mother Margarette sadly passed away on Christmas Day 2013, aged 91. All paintings displayed on this website are Copyright of Gavin MacLeod and the MacLeod family, all rights reserved, 2012. Help was received from many people and businesses throughout the creation of The Gavin MacLeod Collection.